Printers Alley, a Nashville-inspired restaurant in Midtown, will show the Super Bowl on 21 big screens. New York might not have a rooting interest in Super Bowl LI (unless you've jumped on the anyone-but-the-Patriot bandwagon), but that doesn't mean you can't kick back and enjoy Super Bowl Sunday. Last year more than 111 million people watched Denver Broncos beat the Carolina Panthers, 24-10. It was future hall of fame quarterback Peyton Manning's last game in the NFL. This year, the New England Patriots will face off against the Atlanta Falcons in Houston's NRG Stadium at 6:30 p.m. on Feb. 5. Whether you're in it for the football, commercials or food, there are a lot of different ways to enjoy the big game in the city. Homebodies can cater in, and barflies can head to out for everything from a burger and beer to high-end table service. But a great Super Bowl party needs more than just wings. If cooking isn't your forte, there are plenty of restaurants that will cater your game day gathering. Here's a look at a few options. If your guests are going to be craving sandwiches on Super Bowl Sunday, the 2nd Ave Deli's two locations have got you covered. The Super Bowl Feast for 10 People includes two kinds of hors d'oeuvres, two side salads, a platter of 10 assorted deli sandwiches and pickles. And there's chocolate babka for dessert. The package is $325 or $350 if you order after Jan. 28. If you're feeling like barbecue for the big game, Mighty Quinn's is taking orders available for pick up at its Manhattan and Brooklyn locations. The Super Bowl takeout special will score you a pound each of brisket and pulled pork, a rack of spare ribs, baked beans and slaw for $85. You also can add on an order of 10 wings for $12.50. Email catering@mightyquinnsbbq.com to place your order before 5 p.m. the Wednesday before the Super Bowl. If you've got a big party, you might want to look into the Game Time Party Box. It's stuffed with guacamole and chips, smoked chicken nachos, hot wings, brisket sliders and chocolate chip cookies. You'll also get Dos Caminos' signature "El Camino" margarita mix (just note, you'll have to add the tequila yourself). The box, which is available for takeout or delivery from any of the restaurant's locations, is $175 for 10 people. Pre-ordering is encouraged. This Bayside spot is offering several catering options including a "Football Feast for Five," which comes with 30 hot or barbecue wings, chicken noodle soup, potato salad, coleslaw, pickles and your choice of either five deli sandwiches or a two-foot Israeli Hero for $94.99. You can order online or by calling 718-229-2367. If staying at home for the big game isn't your thing, the city's bars will be packed with football fans on Super Bowl Sunday. Here are a few spots for every kind of watch party experience from cheap to luxe. This Nashville-inspired restaurant will show the Super Bowl on 21 big screens. 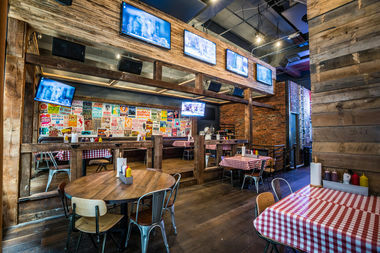 The restaurant's menu, which features southern favorites like hot chicken and pimento, will offer a "touchdown" menu of drink specials including $20 domestic pitchers, $25 Coors Light and Bud Light buckets, $8 frozen drinks and $6 well drinks. The party starts at 4 p.m. at Hudson Common in the Hudson Hotel. The hotel is offering table packages for fans starting at $500 for four people (plus a booking fee). That gets you a reserved table, one bottle of Absolute with mixers, a bucket of beer, and a tray of stadium food. The price jumps to $750 for six and $975 for 12. You can reserve your table here. The Rockefeller Center and Downtown locations for this chain is offering half-priced appetizers and $5 mini burgers on Super Bowl Sunday. Football fans can wash that all down with $15 pitchers and $5 pints of draft beer. Even better? Reservation's aren't required. Class up your Super Bowl bash by throwing it at this Upper West Side cocktail lounge. The Manhattan Cricket Club is hosting private viewing parties in its parlor and library rooms. For $75 a person, your party can get unlimited old fashioneds, martinis, wine and beer along with "elevated bar snack platters." If you're interested in reserving the space, you can email the owner, Tim Harris, at tim@mccnewyork.com. How about heading to church this Super Bowl? First Corinthians Baptist Church will be screening the big game with multiple TVs, raffle prizes and a potluck of home-cooked food. Congregants and more than 250 people from a local shelter will then settle down and watch all the action on the gridiron. There will be free haircuts and bags of toiletries for those in need. Settle down in front of one of the 14 screens to watch the Super Bowl with sound. Call 212-866-4500 for more details. Watch the big game on 12 TVs while sipping on a special cocktail called the Perfect Illusion, an homage to half time performer Lady Gaga. You can make a reservation by calling 212-832-1551. Watch the big game on a very big screen. The Nitehawk's putting the Super Bowl on one of its theater screens and offering table-side service. You can snag a reserved seat for a $30 food and beverage voucher that will get you hot wings and regionally-based drink specials for Boston and Atlanta in honor of the teams. Hit up this optional open bar and have your food and drinks taken care of all night long. A ticket will get you a guaranteed seat and an open bar of well drinks, house wines and draft beers for the duration of the game. Tickets are $50 and $60 at the door. You can reserve your spot by calling 718-361-8488 or emailing woodbineslic@gmail.com. If catering in isn't your idea of a good time, you can reserve a party room at Ben's for you and your friends. This Queens location has a dining room with room for 150 or a party room with room for 80. Call 718-229-2367 to reserve. Head to this Port Morris bar to watch the Super Bowl in the back room, and chow down on 50 cent wings. There will also be two-for-one drinks all night. Join Catholic Charities of the Archdiocese of New York for the "Souper Bowl." A $35 ticket will help provide 140 meals to hungry New Yorkers, and will get you one drink at the bar while you watch the action. You're also encouraged to bring canned foods to donate to local food pantries.